An inspiring electrician received an insight into his trade of choice with a Dundee-based maintenance company as part of a national employment initiative this week. 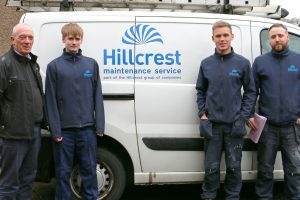 Dale Cartmill has been shadowing Hillcrest Maintenance Services (HMS) electricians for a week’s hands on training as part of the Prince’s Trust Get into Electrical scheme. HMS operations supervisor (electrical), Alan Lonie said: “It’s important to give young people the opportunity to get a real insight into the working day of a trade before they decide on their career. HMS has recently been working with Dundee’s Braeview Academy to engage with school pupils as they start to think about what career path to take.